The sun is about to get a lot more active, which could haveill effects on Earth. So to prepare, top sun scientists met Tuesday to discuss thebest ways to protect Earth's satellites and other vital systems from the comingsolar storms. Solar storms occur when sunspots on our star erupt and spewout flumes of charged particles that can damage power systems. The sun'sactivity typically follows an 11-year cycle, and it looks to be coming out of aslump and gearing up for an active period. "The sun is waking up from a deep slumber, and in thenext few years we expect to see much higher levels of solar activity,"said Richard Fisher, head of NASA's Heliophysics Division. 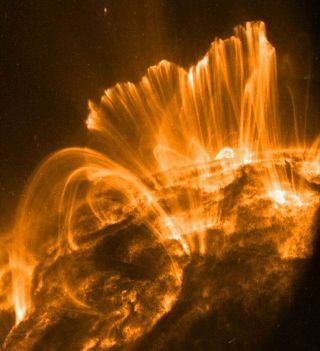 "At the sametime, our technological society has developed an unprecedented sensitivity to solarstorms. The intersection of these two issues is what we're getting togetherto discuss." Fisher and other experts met at the Space Weather EnterpriseForum, which took place in Washington, D.C., at the National Press Club. People of the 21st century rely on high-tech systems for thebasics of daily life. But smart power grids, GPS navigation, air travel,financial services and emergency radio communications can all be knockedout by intense solar activity. Luckily, much of the damage can be mitigated if managersknow a stormis coming. That's why better understanding of solar weather, and theability to give advance warning, is especially important. Putting satellites in 'safe mode' and disconnecting transformerscan protect electronics from damaging electrical surges. "Space weather forecasting is still in its infancy, butwe're making rapid progress," said Thomas Bogdan, director of the NationalOceanic and Atmospheric Administration (NOAA)'s Space Weather Prediction Centerin Boulder, Colo.
NASA and NOAA work together to manage a fleet of satellitesthat monitor the sun and help to predict its changes. A pair of spacecraft called STEREO (Solar TerrestrialRelations Observatory) is stationed on opposite sides of the sun, offering acombined view of 90 percent of the solar surface. In addition, SDO (the SolarDynamics Observatory), which just launched in February 2010, is able tophotograph solar active regions with unprecedented spectral, temporal andspatial resolution. Also, an old satellite called the Advanced CompositionExplorer (ACE), which launched in 1997, is still chugging along monitoringwinds coming off the sun. And there are dozens more dedicated to solar science. "I believe we're on the threshold of a new era in whichspace weather can be as influential in our daily lives as ordinary terrestrialweather." Fisher said. "We take this very seriously indeed."